to be a restaurant critic? Restaurant critics, dontcha love them? Well, no, not really just at the moment. It’s Lucinda again. Ms O’Sullivan recently said while reviewing a restaurant that actually imports Canadian lobster “I liked the fact that there wasn't any bull about this being ‘local lobster’ – as I am getting in other restaurants.” Bull? Look, as the owner of two restaurants that serves only local lobster – so local that it is caught by our own boat which operates out of Dun Laoghaire – I’m totally gobsmacked. It doesn’t end there. It get’s better. Or worse, really. Lucinda goes on to say “They [the restaurant under review] intend to have local lobster in season”. To qualify as a restaurant critic or food columnist (and that’s another story, of course) you need to know that there is no season for Irish lobster. Irish lobster is landed by hard-working Irish fishermen all year-round. So, the Sunday Independent appears to be promoting the consumption of Canadian lobster (which, incidentally, is being dumped on the world market as the Canadians are experiencing an enormous glut in lobster production, See CBC News report) at the expense of Irish fishermen and women who risk their lives virtually every day to bring ashore “local” lobster for Irish consumers. In fact, it’s worse than that. The Sunday Independent, by publishing Lucinda O’Sullivan’s flagrantly erroneous comment, seems to imply that Irish lobster is not available at this time of the year and that claims for “local lobster” are, at best, spurious. As a purveyor of genuinely local lobster, I take grave exception to this. In our experience, imported lobster, such as Canadian lobster, is an inferior product when compared to fresh Irish Lobster. 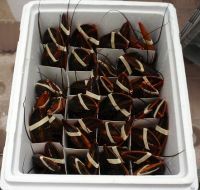 They are cheaper than Irish lobster and tend to hold their price throughout the year. ...In the case of Canadian lobster (which are mainly from the USA and exported through Canada), their shells tend to be softer and have a plastic feel when being cracked. There is little or no flavour from these lobsters. Certainly compared to Irish or Scottish lobster. From an animal lover’s point of view, I was disgusted to see how these creatures are transported from Canada. Put in waxed cardboard boxes with dividers, they are forced into tight compartments “cruelly” pointing up-wards while forced to sit on their tails. The poor lobsters have to endure this for well over 2 days. If the lobsters do arrive alive, it is only barely. From a conservation point of view, these lobsters might look the same but they are not. They are merely closely-related lobster species and it is only a matter of time, if it hasn’t happened already, that someone decides to release one or more of these non native American lobster, Homarus americanus (Canadian if you like) into Irish waters and we end up with some sort of cross between our European lobster, Homarus gammarus, and this American imported lobster. By allowing the live import of these lobsters we are running the risk of loosing our highly sough after Irish Lobster forever. We are calling on the Irish government to ban the import of live lobster from Canada on the grounds of cruelty and conservation. There are so many things wrong with this practice its hard to know where to begin. At Ouzos, we will continue to only support our hard-working Irish Fishermen and women and treat our live lobsters with the respect that lobsters deserve.